Details of our next Café can be found here. The Community Café, set up under Withyham Parish Council's 'Forward for Five' initiative, has been running for almost a year now, the first one taking place in March 2016, and being hosted by the "Founders" group. The aim of the monthly Saturday Café, running from 10-12 noon, is to bring people together and to give them somewhere to meet up over a relaxing beverage and delicious home-made cakes and biscuits. Old friends meet up on a regular basis there, and new friends and contacts have been made over the last year, which we hope will continue long into the future. 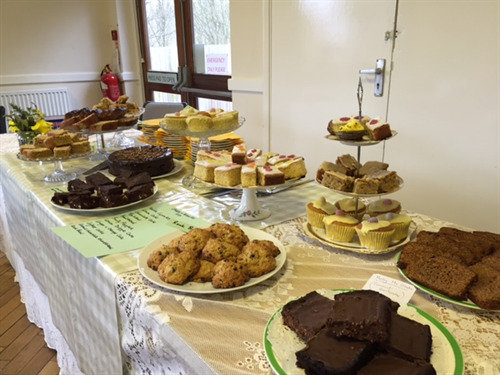 Very often the Withyham Parish Amblers, a walking for pleasure monthly event, which was also set up under the 'Forward for Five' initiative, join the Café after their walk and enjoy what the Café has to offer. 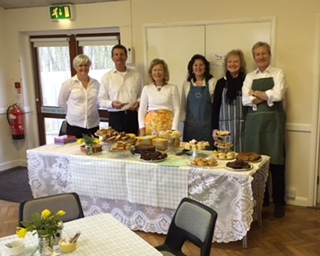 Several clubs, groups and societies have taken it in turn to host and run a Café, the W.I., PreSchool, St. Thomas's Church, St. Thomas's School, the Scouts and Groombridge Horticultural Society have all had a turn. Each group has brought its own special personality to the Café and each one has been hugely enjoyed and well attended. After expenses, we ask that a small amount from your takings is given back for restocking and any profit a group makes is either given to charity or to the group's own funds to help with its running. Money has been donated from profits to local lunch clubs for the elderly, and to other local groups as well as more national charities, but on a local level. We are already nearly booked up for 2017, with some new hosts including Groombridge Bowls Club, Withyham Art Group, Groombridge Youth Group, and hopefully, the Scouts and Forestry Commission together. Each group provides the people power, the cakes/biscuits and any extras such as table decorations, but the coffee, tea, sugar, tablecloths, coffee makers, hall booking and any guidance and help is provided by the Founders, so apart from a couple of happy hectic hours and some baking, there really isn't too much to do. Although the Café is mostly held in Groombridge, we would love to have it held by a local Blackham, Withyham or St. John's group; we would provide the basics, and we don't want anyone in the Parish to miss out, or feel that everything happens in Groombridge only! We really look forward to seeing you at our next Café.